Baby North West, daughter of Kim Kardashian West and Kanye West, was born in California on June 15, 2013. The toddler has been rocking only the best custom designer outfits every since she stepped out of the womb. I would not be surprised if Kim Kardashian had North wrapped in a custom Hermès baby blanket the minute she was born. North West is about to turn 2 years old, so why not highlight her best fashion statements so far? The toddler has hit up the hottest runway shows over the past year. 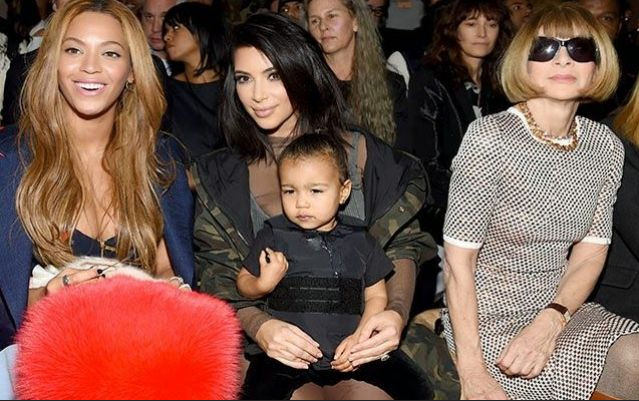 One of the shows North West was in attendance for was Alexander Wang’s Fall 2015 Ready-to-Wear showing in February. The 1-year-old and her parents were wearing similar ensembles. Wang himself custom-designed a look for the baby that made people look on, drooling with envy. North wore a fur-lined bomber jacket that was similar to the ones seen on the runway for this year’s collection. She was seen wearing not just one piece, but head-to-toe black attire, all made by the famous Wang himself. North West, however, was not satisfied with this look or the front row seat at one of the most important. According to Just In, she began to cry as her mother stared in horror. North West did not stop at the Alexander Wang fashion show — she was also seen at her father’s New York fashion week show for his newest collaboration with Adidas. Once again, in what seems to be her signature all-black style, North West wore a bulletproof vest from her father’s new collection. Kim even wrote on her Twitter account about her baby’s mini custom vest: “Look at my little cutie!!! #DaddysMuse #BabyYeezyBulletProofVestFollow,” News One reported. However, I am not sure why Kanye West would be making bulletproof vests, and the entire collection was confusing. The little one did not leave her tantrums at the Alexander Wang show, either. North West also threw another hysterical fit crying in the front row of her father’s show, seated in between Anna Wintour, editor-in-chief of Vogue magazine, and Beyoncé, the queen herself. According to News One, Wintour and Beyoncé were seen looking in the opposite direction and moving away from the hysterical toddler. It was nice of Kaufman to stand up for the toddler, seeing as she does not know any better as to whether or not the coat is real. In my opinion, it is a bit extravagant for such a young kid to be wearing something this expensive. However, we have to remember the family North West comes from and what we already know and expect from her extravagant parents. I am excited to see how North West’s style is going to develop when she is able to make her own choices regarding what to wear in the morning. We can already see her style showing through as she pulls her “Frozen” suitcase with her everywhere she goes. How do you think North West’s style will evolve?